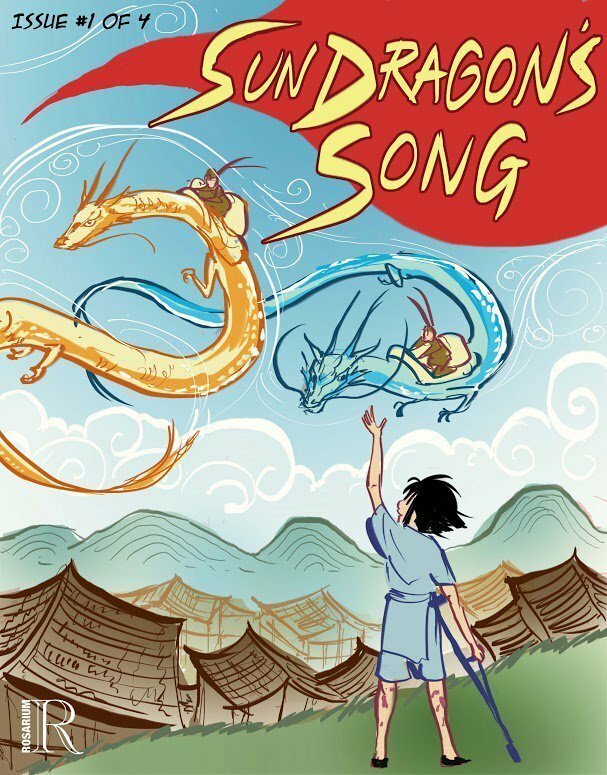 Continuing to blaze trails within the comic book industry by providing diverse tales from creators across broad spectrums of backgrounds, Rosarium Publishing’s latest effort is a fantastical tale of a young, physically challenged boy’s efforts to become a Sun Dragon Rider- human guardians of the dragons that keep watch over the land from high above. It has the markings of a charming story that could be a fine addition to the ranks of diverse young adult offerings. Kim Miranda’s art is delightfully whimsical with a light and airy feel to it, somewhat reminiscent of ukiyo-e woodblock prints and making for a perfect match for the story and its theme, especially in the way the colorful dragons dance seemingly dance across the page. It’s probably important to note that these are Chinese dragons, slim and serpentine as opposed to the bulky dragons of European lore. The colors are soft, almost pastel-like and help give the comic an almost storybook quality. While a bit awkward in spots, the hand lettering (presumably by artist Miranda) fits well with the art and helps establish the general feel of the comic.The story hits all the right notes for a classic coming of age type story with the unique them providing a touch of freshness. My only complaint- and it’s not, really- is that there isn’t more as the “issue” format really does seem to do a disservice to a delightful story that feels as if it should be absorbed whole. You are left wanting to know as much as possible about this world. Make no mistake though, this is a quality work well worth checking out. All in all a very nice package and an impressive work that bolsters Rosarium’s already impressive lineup. William Satterwhite is the creator of the superhero webcomic Stealth and a freelance designer, internet consultant and illustrator living in Douglasville, Ga. His professional website can be found at www.williamsatterwhite.info.